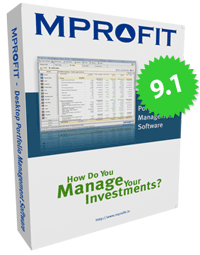 With version 9.1 two major features were added to MProfit Pro and Advisor: 1. Managing your Futures and Options (F&O) trading 2: MProfit Sync – a secure way of having clients view their financial transactions from their computer. The ability to manage a users F&O transactions has been requested quite frequently and the ease of use of importing and entering those transactions is unmatched. This new feature is available in MProfit Pro and MProfit Advisor. Prices are delayed by 15 minutes which is the same as the cash equity data feeds. Anyone using MProfit Pro and Advisor can send messages to all their clients with the built-in MProfit message system. This will allow people to send daily updates or other types of information to their clients in an easy and convenient way.